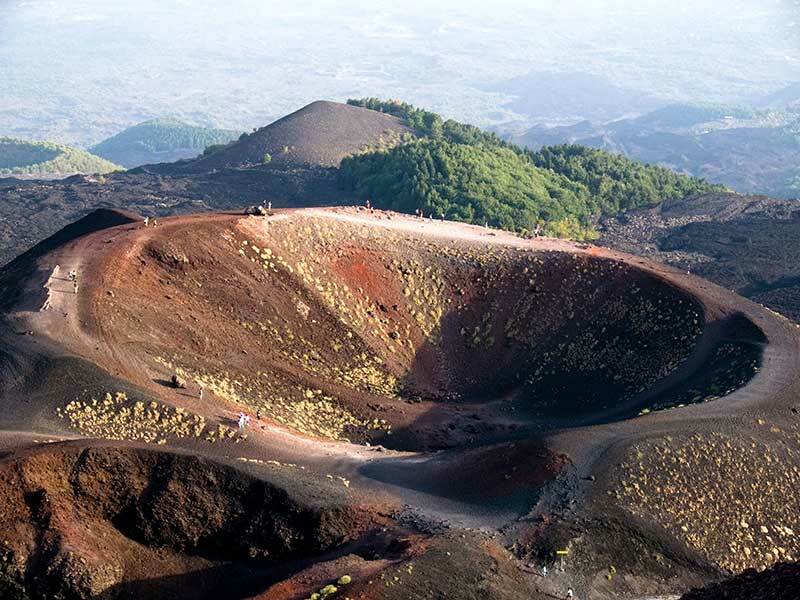 For many years the Italian volcano Etna is one of the most fascinating and exciting tourist attractions. Millions of people from all over the world are arriving every year to Sicily to take pictures of erupting Etna and see an awesome beauty and power of nature. In 2013, the Mount was added to the list of UNESCO World Heritage Sites. Mount Etna is the highest European volcano (3,329 m/10,922 ft) and is located between Catania and Messina on the east coast of the Sicily peninsula. The second highest volcano is Italian Mount Vesuvio (near Napoli). Only Pico de Teide in Tenerife surpasses Mount Etna but from a geographical point of view the Canarian island Tenerife is already located in Africa. 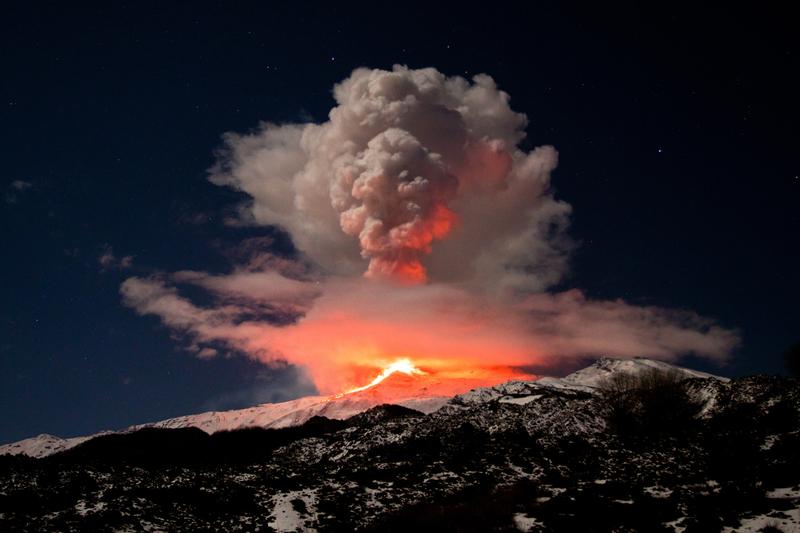 Etna is one of the most active volcanoes in the world and it is almost in a permanent activity. 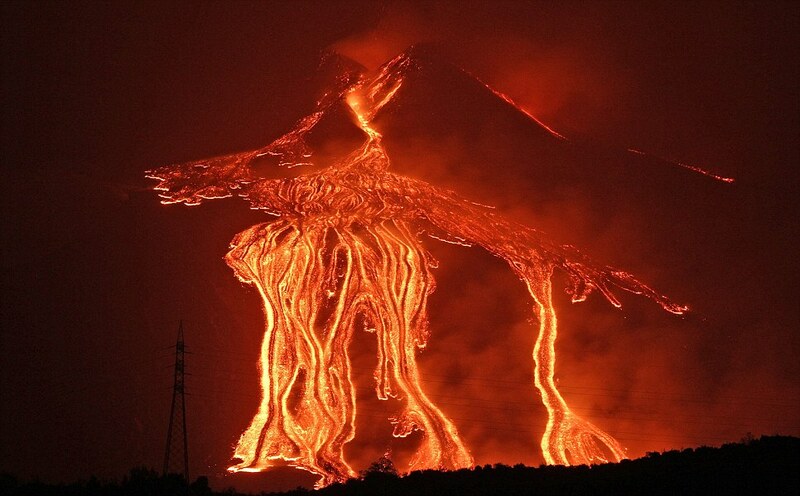 There is the longest documented record of eruptions which display a whole range of types of volcanic eruptions. 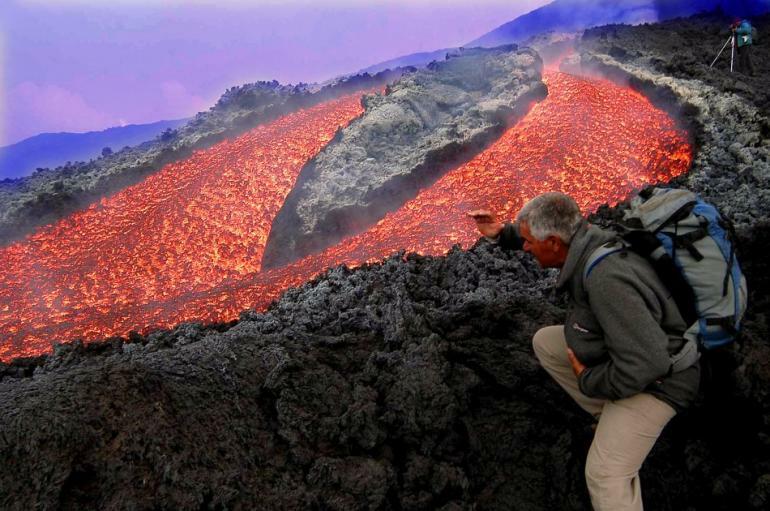 The first recorded observation of its eruption was made by Greek historian Diodorus Siculus in 425 BC. 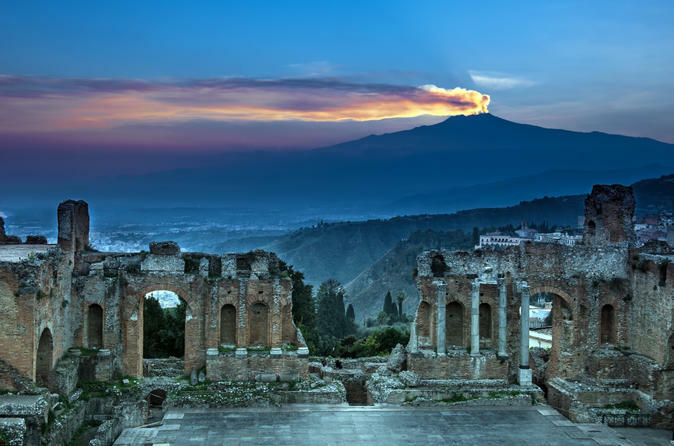 For centuries Etna has been threatening the heavily populated towns and villages situated around but despite the threat, the Mount is a cornerstone of the Sicilian economy and tourism. The fertile volcanic soils support extensiven agriculture, vineyards and and orchards spread across the slopes of the Etna and around the city Catania. 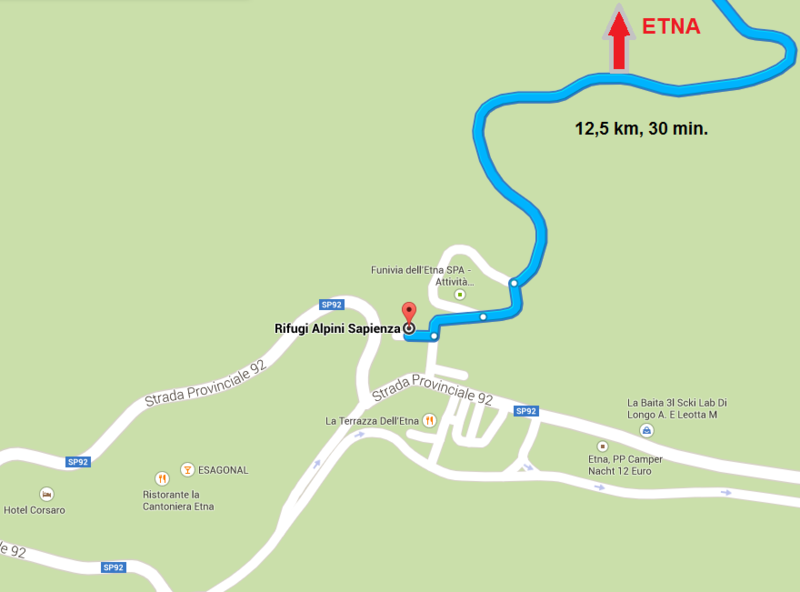 How to get to Etna? 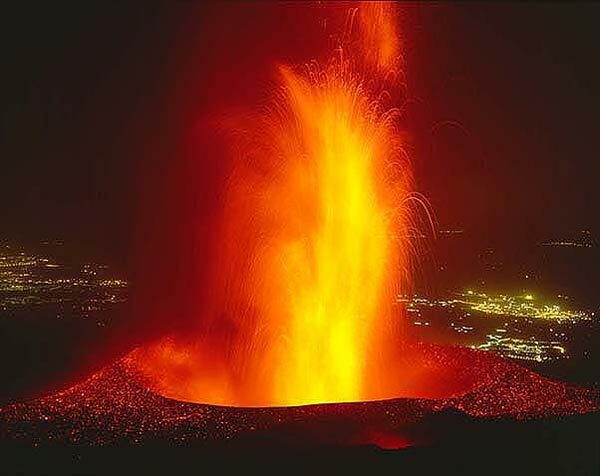 The volcano Etna is located on the east coast of Sicily, about 59 km to the north of city Catania. 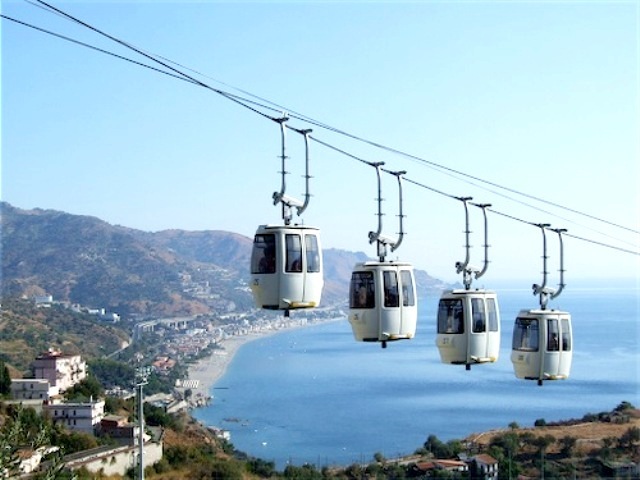 The easiest way how to get it there is to fly to Catania, where is the international airport of Sicily, and then continue by car to Refugi Alpini Sapienza (34 km, 1 hour jouney). From Sapienza you can hire for reasonable price a jeep with a guide and go up to the peak (12,5 km, 30 min.). Cheaper, but physically demanding, is to go up on foot (approx. 2,5 hours). The road begins at the bottom of a cable car station, which served until the summer of 2001. It is usually possible to come to a mountain hut at Torre del Filosofo to a height of 2900 meters above sea level, where access is forbidden but tolerated. Further, the path to the top craters is very dangerous. For adrenalin-lovers and romantic souls, who want to spend one or two nights nearest the crater, I can recommend the small, lovely hotel Corsaro (the location see on the map below). Rooms are spacious and clean. Some rooms have a terrace and offer spectacular view over the valley of Catania. If you are lucky you will see an eruption showing a splash of red in the sky above Etna. There is also a nice little spa in the hotel helping to relax at the end of a day trekking. 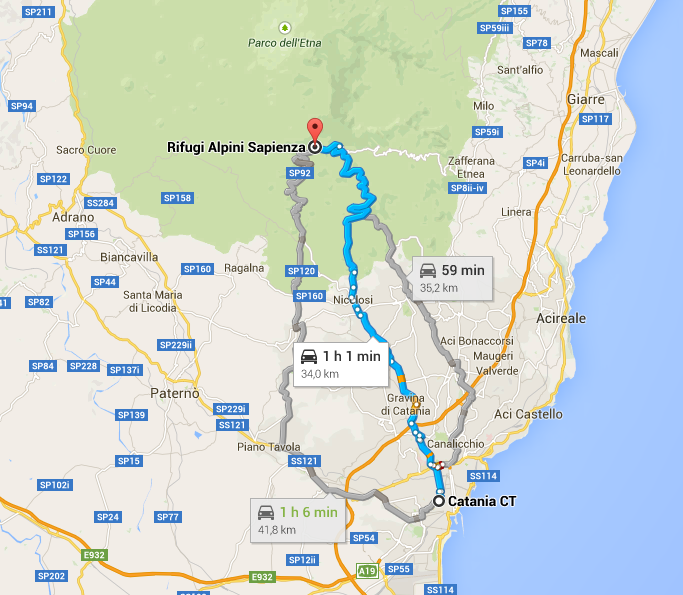 Rent a car and go from Catania to Rifugi Alpini Sapienza. Then hire a guiding-driver with jeep. A great experience is a nocturnal climb from Sapienza on the peak of Etna. The view on the the illuminated Sicily and the Calabrian peninsula in southern Italy between the Tyrrhenian and Ionian sea leaves in each person the impression of a lifetime. 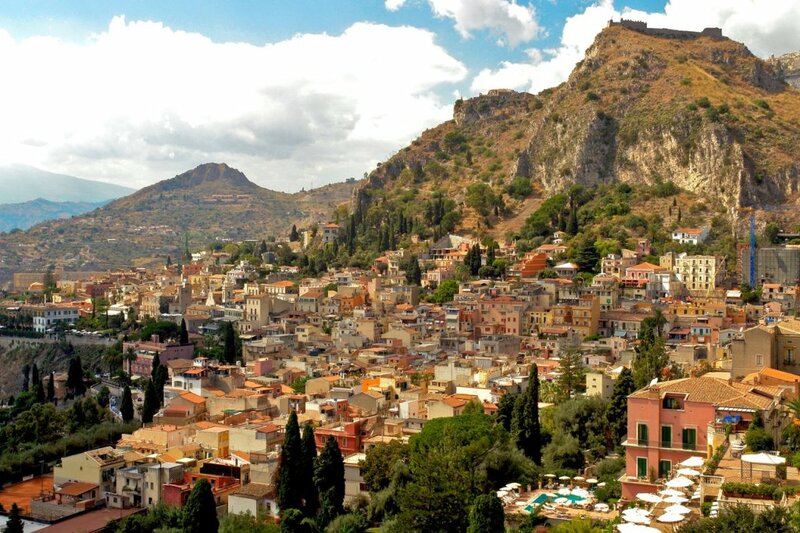 The lava flows down the hills above the city of Catania and Taormina. 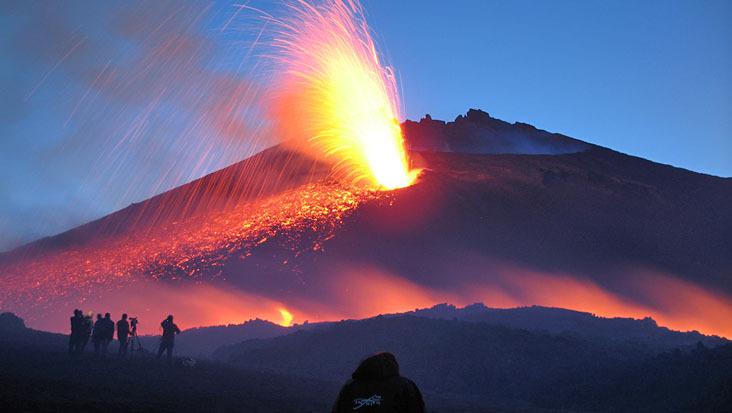 The eruption of Etna offers to adventurous people the unique, unforgettable performance, especially at dawn. 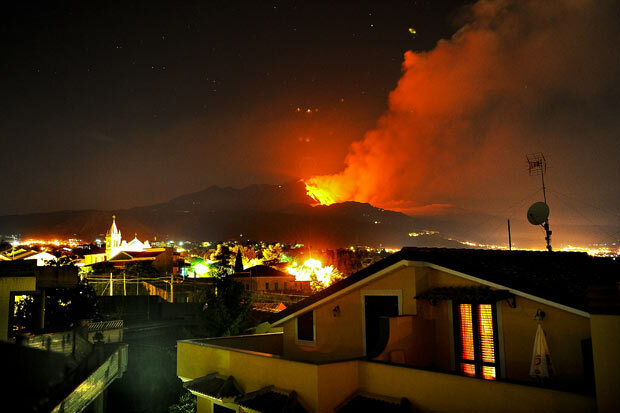 A nocturnal show of erupting Etna, a view from 50 km distant city of Catania. The non-erupting crater of the Mount Etna looks very innocently during a sunny spring day and offers to tourists a lovely tour. 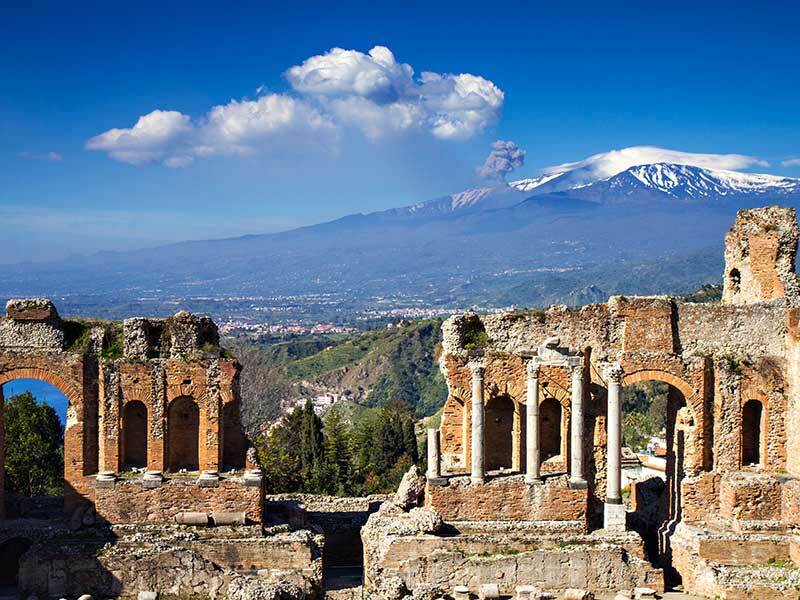 If you decide not to go up to Etna, for sure do not forget to visit the lovely, mediaeval town of Taormina, offering beautiful views of the Mount Etna. 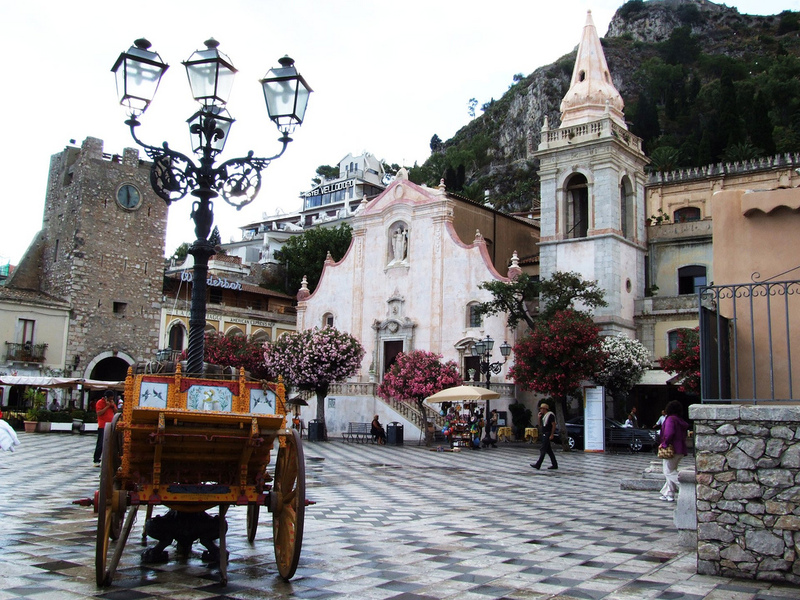 When visiting Sicily you definitely need to watch your wallet and cameras!